A Motley of Colors. 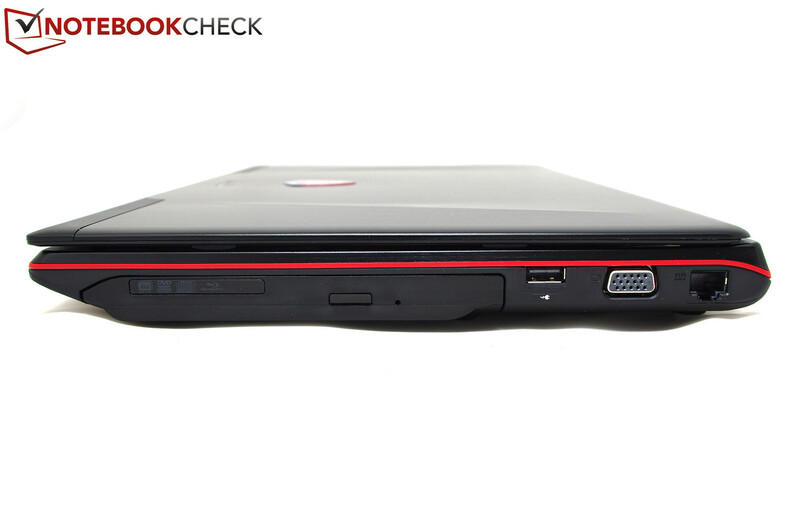 Once again, we find an MSI GE60 gaming notebook on our table with advanced hardware and an interesting design. A faster i7 processor and backlit keyboard make the laptop quite attractive at first glance, but can it deliver what it promises? Whether the GS70, the GE70 or the GT70 - the MSI gaming series pairs interesting design with good hardware for an interesting price. Our test model costs between 1,150 to 1,250 Euros (~$1568 to $1704) and is equipped with an Intel Core i7-4700HQ CPU and a middle-class GTX 860M GPU. 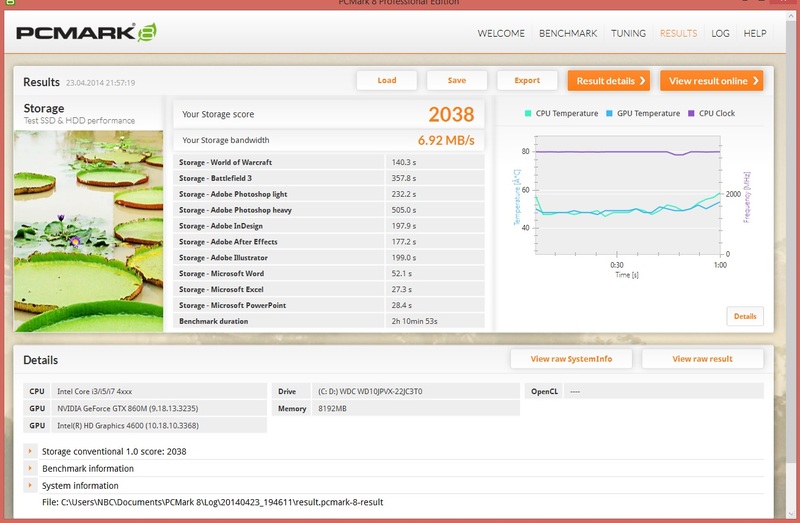 Instead of an SSD, the test model uses a traditional HDD, which has not been partitioned by the manufacturer. Eight gigabytes of RAM in a single slot offer the user the option of upgrading further. The anti-glare Full HD display allows the user to work comfortably in bright surroundings. 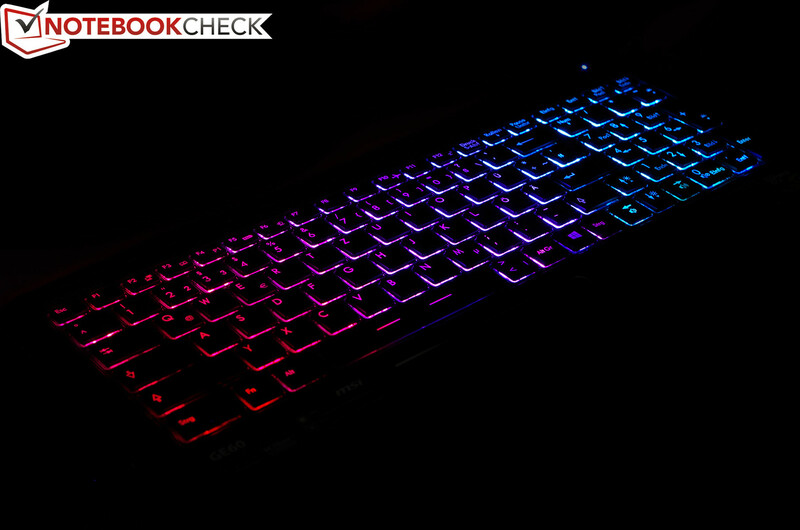 The backlit keyboard with its various colors is designed to attract gamers. The test model is equipped with either a DVD or a Blu-ray drive. We test the latter. In a higher price range, the buyer will be able to add on an SSD or more RAM. In comparison to the GE60H, the case of our test model has been changed a bit. 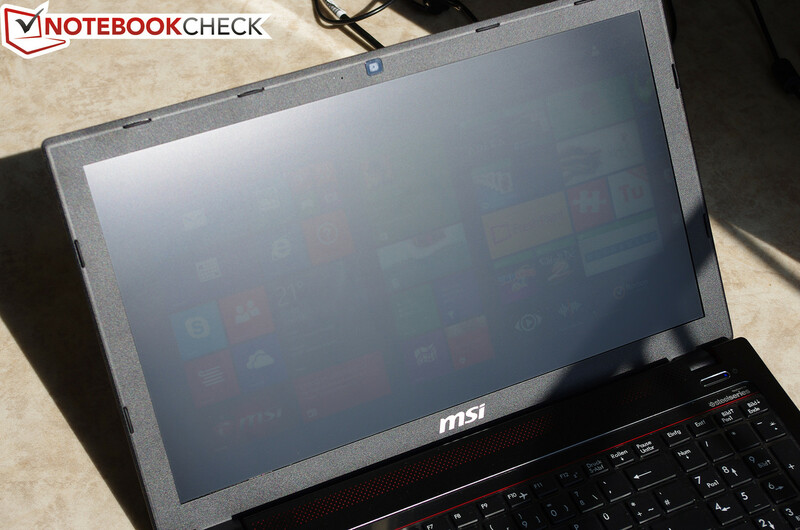 Instead of a glossy design, MSI has chosen a metallic surface made of brushed aluminum. 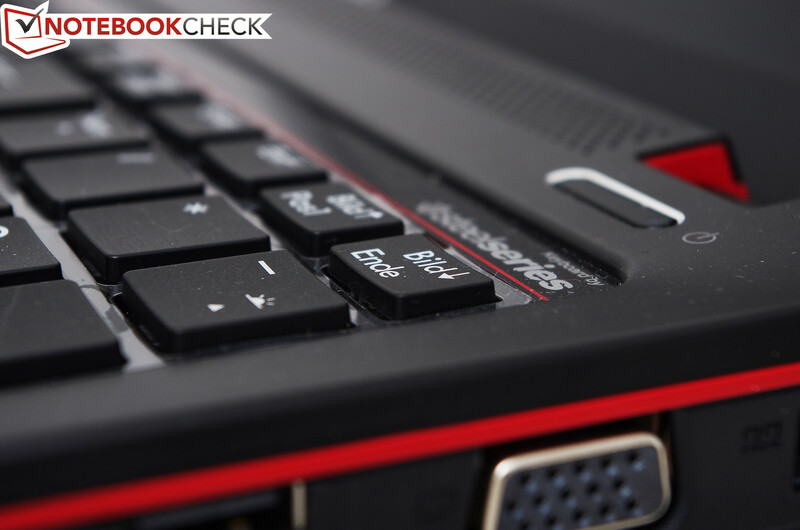 Even without the gloss, the laptop still attracts fingerprints and the display cover is soon filled with smudges. These are hard to clean with a cloth. All in all, we see a positive step forward, as the GE60 is definitely of better quality than its predecessor, the GE60H. The manufacturer has installed hand-rest regions with a metallic finish. 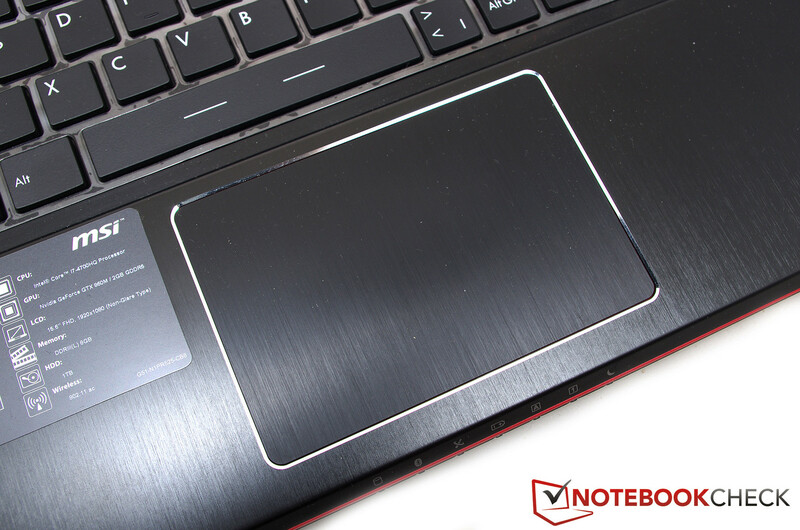 Although it also attracts fingerprints and smudges, the metallic surface is comfortable and raises the quality of the laptop. The workmanship is another matter of taste: the hinges are quite loose, which allows the display to be easily adjusted. However, this means that the display might adjust itself when moving around with the laptop. We found the pressure-sensitive display cover to be a much more serious matter. The chassis is thankfully sturdy, but the battery is awkward to get into the case. 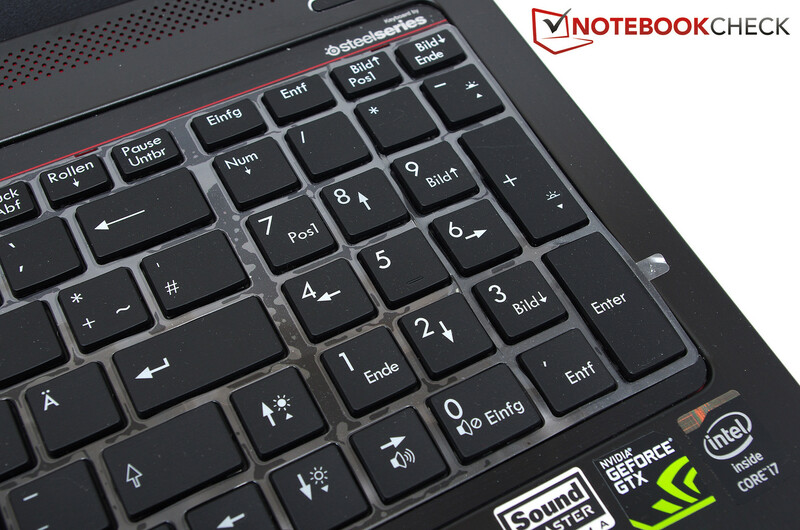 The weight and the measurements are great for a gaming laptop: at 2.7 kg (~5.95 pounds) with the battery and measuring 383 x 38 x 250 mm (~15.1 x 1.5 x 9.8 inches), the GE60 is a well-designed mobile gaming laptop. The hand-rest regions are of good quality. The connectivity is identical to the GE60H: it is very good, although the two USB 2.0 ports should be upgraded to USB 3.0. It is possible to connect the mouse on the right or left side. Regardless which side you choose, the proper placement of ports will not hinder your mouse while gaming or working. MSI provides an analog VGA port as well as a digital HDMI interface for connecting displays. Both interfaces are easy-to-reach and do not cause any inconvenience while using an external display. 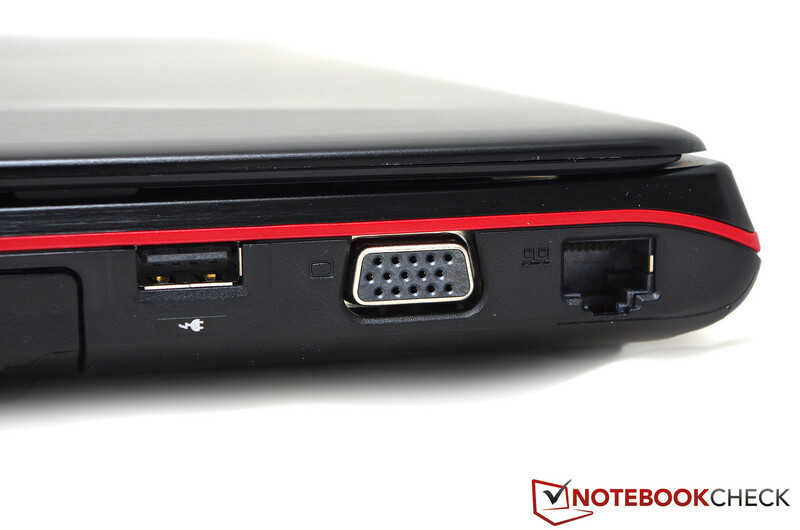 Only left-handed users might have problems with the ports, which are concentrated somewhat towards the front. 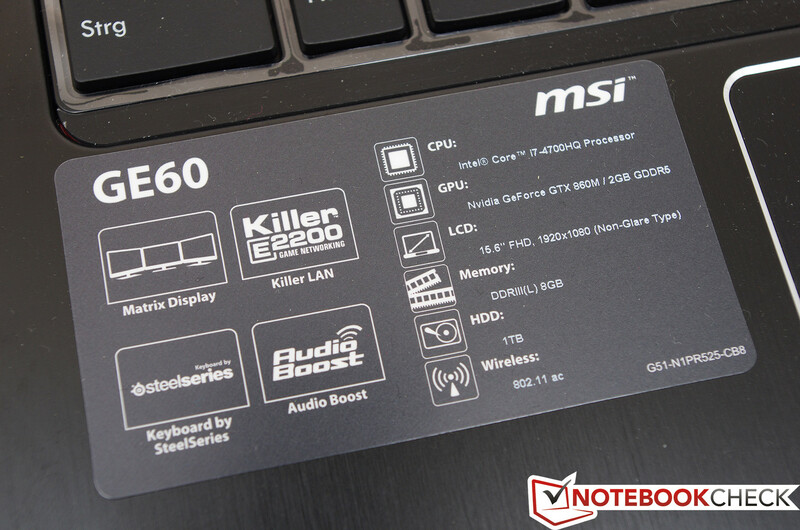 Online gamers and streamers will be happy to find the Killer-e2200-network card from Qualcomm in the laptop. 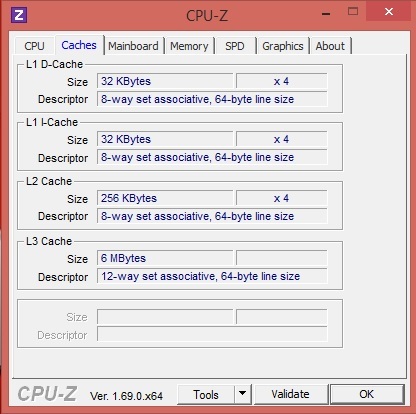 The card offers options to optimize the upload and download speeds in the driver. This improves the ping as well as upload speeds for individual applications. 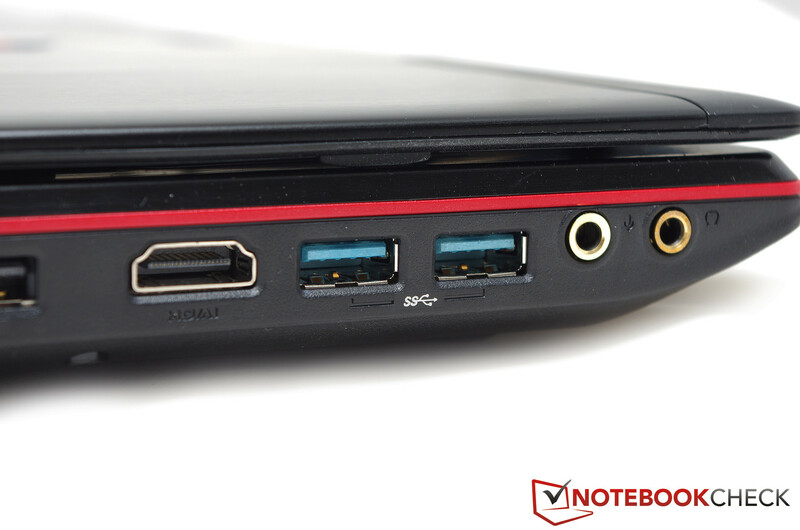 Furthermore, the MSI GE60 uses an Intel WLAN chip. In our test, the module proved to be very unstable and slow, as at a distance of 6-7 meters (~20-23 feet), we only had 1 or 2 bars (D-Link 300 MB router). The download speed reached a maximum of 500 KB/s with a 64 MB connection. During the test, we observed multiple drops in the connection. Devices with the same chip were able to achieve much better results, so we cannot conclude whether the problem lies in a thicker metal case or in the chip itself. The notebook is delivered with the necessary Quick Start guides as well as a DVD containing the required drivers. Backup DVDs need to be created by the buyer or purchased optionally from the manufacturer. As witnessed in other MSI laptops, the software can be a little much. The GE60 comes with a multitude of programs preinstalled and these slow down the system significantly. The system may be slowed down, but not all the applications are useless: for example, the Cyberlinks PowerDVD or the Magix MX Suite prove quite handy. MSI provides a 24-month warranty. 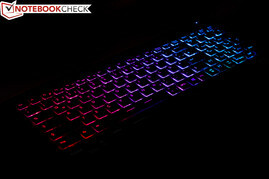 MSI has installed a backlit, SteelSeries keyboard in our test model, which can operate in many bright colors. The SteelSeries keyboards are well known from other MSI models. They have an unusual layout, which requires a little getting used to. For example, the Windows key and the <> keys are not to be found on the left side, but rather placed on the right side. The Enter key is also halved. Typing is comfortable as the flat keys have a short stroke distance and are quiet. The keyboard is suited for users with small to medium-sized hands. We especially like the large hand-rest areas. The touchpad is large: 106 x 70 mm (~4.2 x 2.8 inches). This would make working very comfortable had not the keys been integrated directly underneath the surface, as these raise several issues. If you click once and leave your finger on the pad, then the mouse cursor will slide or jump around wildly. The surface is not optimal either as it comes across as a little sticky. The mouse keys are comfortable to press and produce a loud clicking noise. The keyboard can be lit up in many colors. The touchpad is a little slow to react. The Samsung display (156HL01-102) has a resolution of 1,920x1,080 pixels and proves to have strong contrast and brightness in the test. 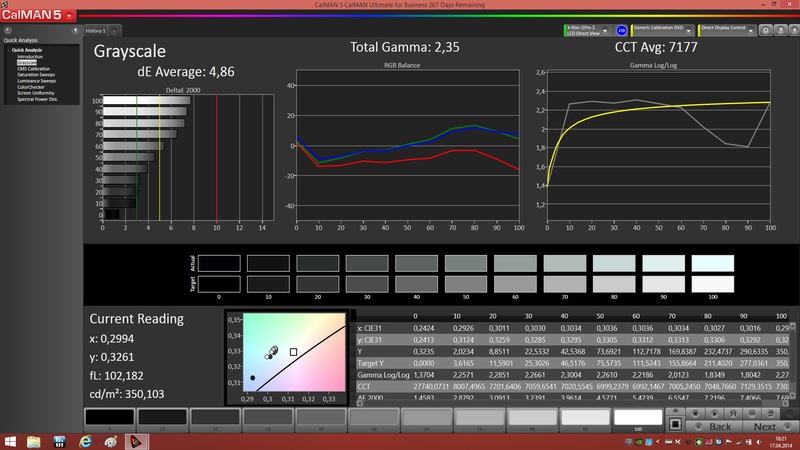 In comparison to the GE60H, the panel is much brighter and has a higher contrast ratio. 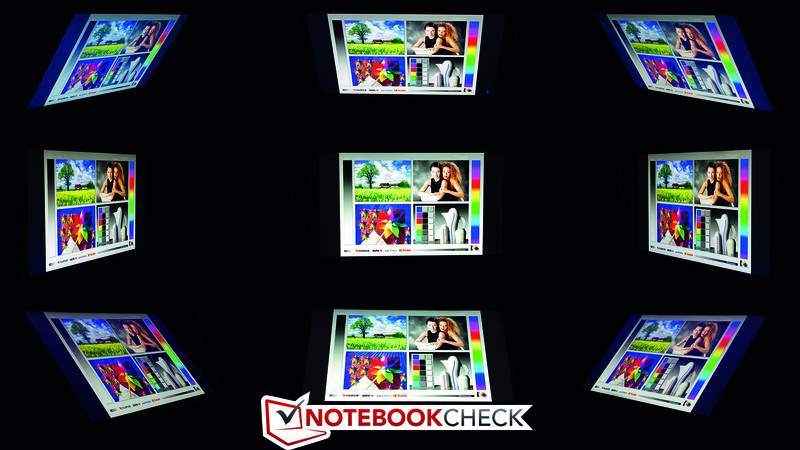 The average brightness is 309 cd/m², which means the display is quite bright. The lower screen falls below the 300 cd/m² mark, but this is not noticeable as the difference in brightness to the middle area is quite small. 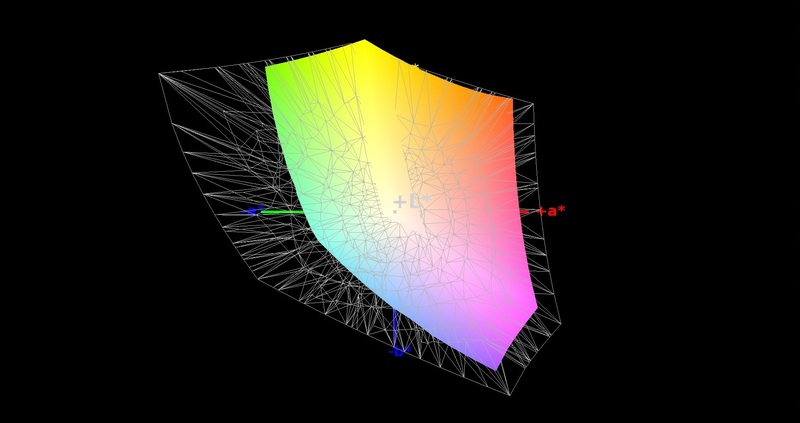 The black value of 0.43 cd/m² is not ideal and has not improved since the GE60H. Despite high brightness, the panel is barely legible in direct sunlight. The panel becomes hard to read even when the light falls on it from the side. The GE60 is not ideal for outdoor use, but it can be used in a well-shaded area. The viewing angle stability is quite good. The picture was well recognizable from the sides and we did not observe any significant color inversion. 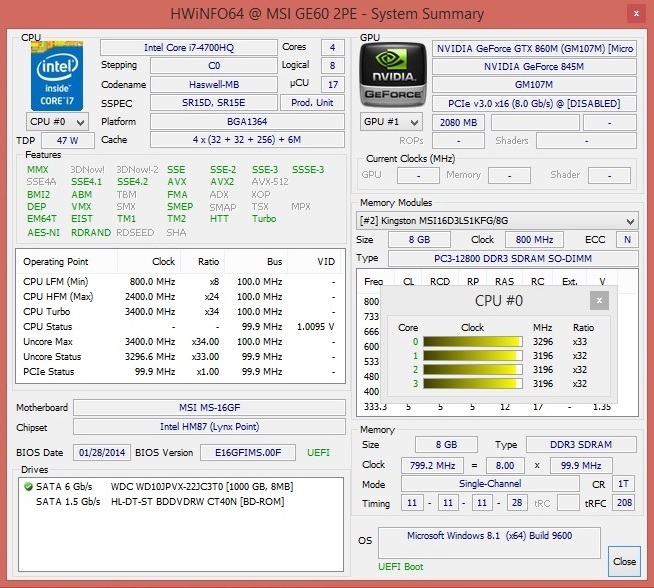 An Intel Core i7-4700HQ CPU with a GeForce GTX 860M graphics card place the test model in the middle to upper gaming class. The processor can simultaneously run up to eight threads thanks to Hyperthreading technology. 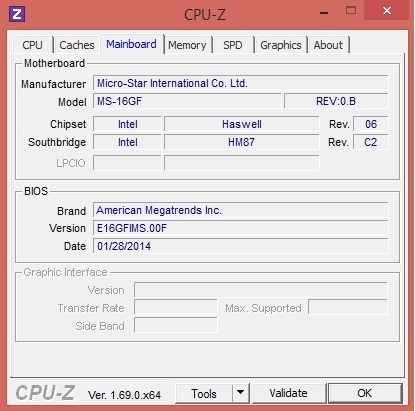 The integrated Intel-HD graphics chip (HD 4600) helps lower power consumption. 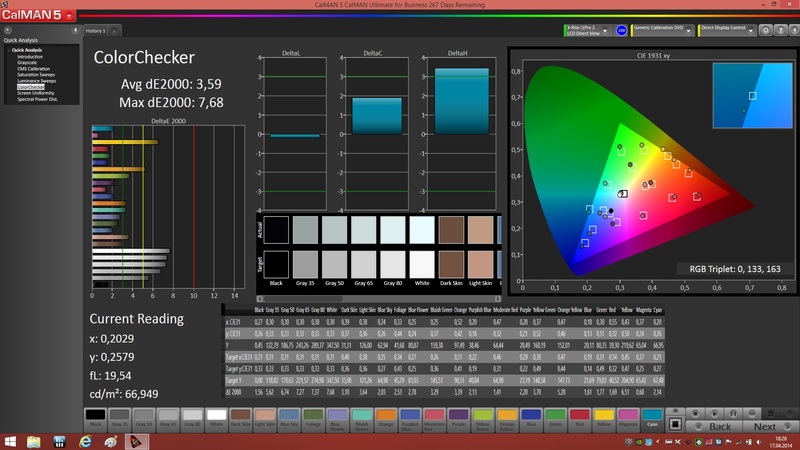 The IGP operates at 400 - 1,200 MHz and is responsible for the graphics when the notebook is set to power-saving mode. 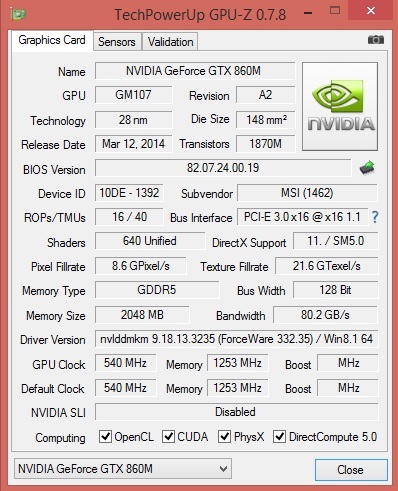 Games and other 3D applications require a lot more power: this is where the GeForce GTX 860M kicks in. The RAM is 8 GB and can be extended by another 8 GB as there is a free RAM slot. The GE60 test model uses a traditional HDD. An SSD can be added on via the free m-SATA slot. We cannot provide any additional information about the model as it was a test sample that we were not allowed to open. 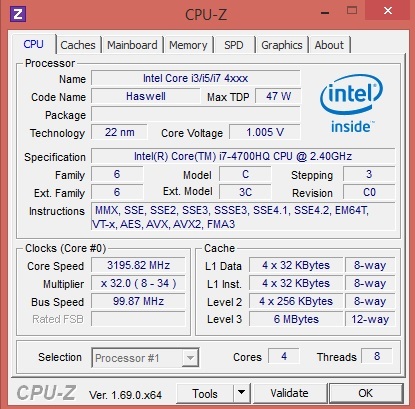 The Intel Core i7-4700HQ is the successor of the Core i7-3630QM. 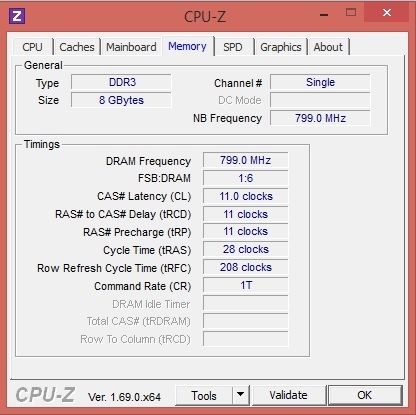 Both processors have identical base and turbo clock speeds. 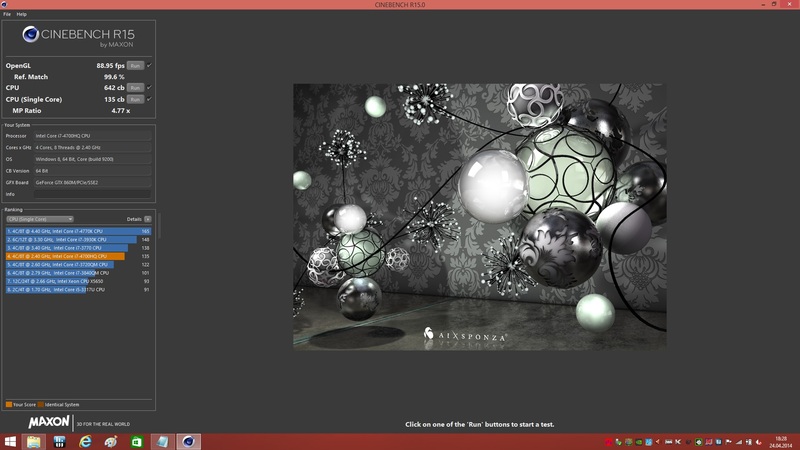 A score of 6.97 in the multi-core test of Cinebench R11.5 places the test model at the same level as the GE60H. 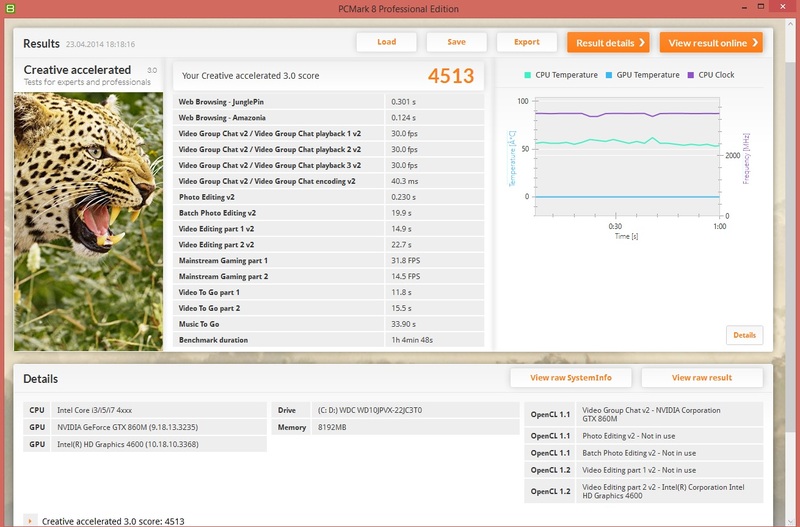 The Gigabyte P34G can surpass our test model with 7.0 points. 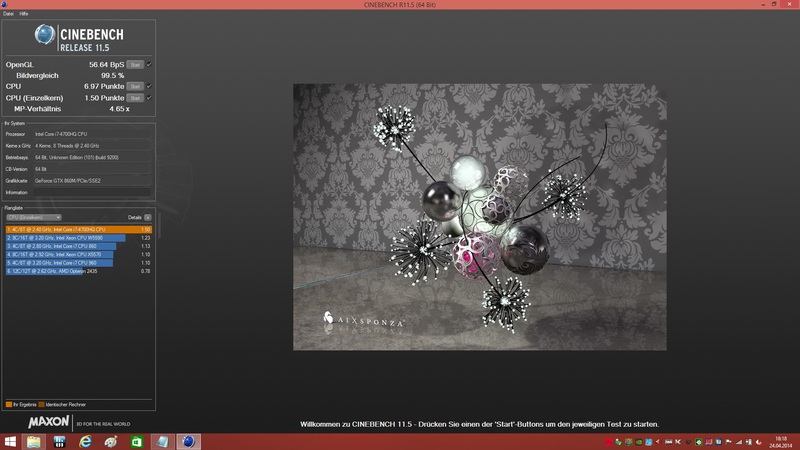 Similar results are produced in Cinebench R15, in which the MSI notebook scores 642 points in the multi-core test. This places it at the same level as the Asus N56JR and the MSI GE70. 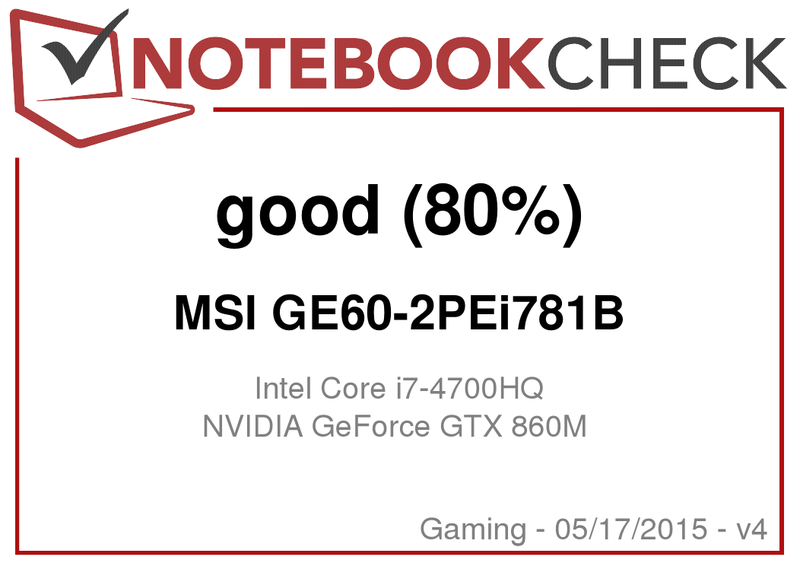 In PCMark 7, the MSI GE60 delivers an acceptable performance: 3,142 points. 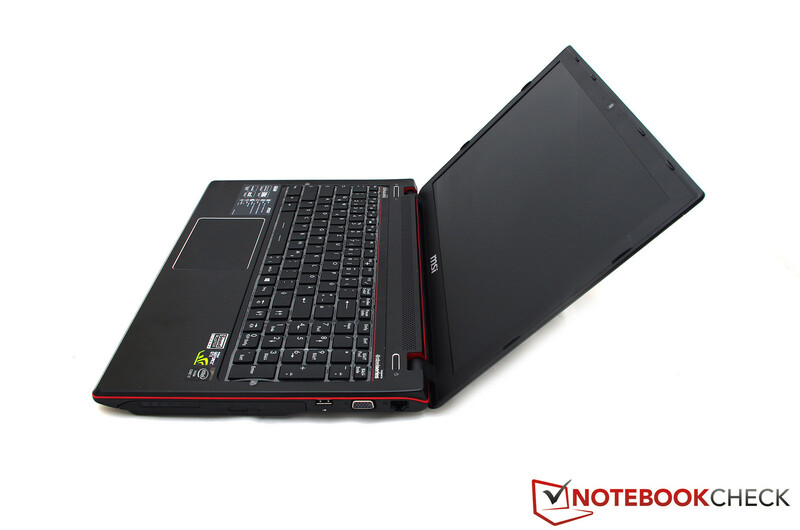 Notebooks like the Asus N56JR or the Schenker XMG A504 score 3,300 and 5,800 points. 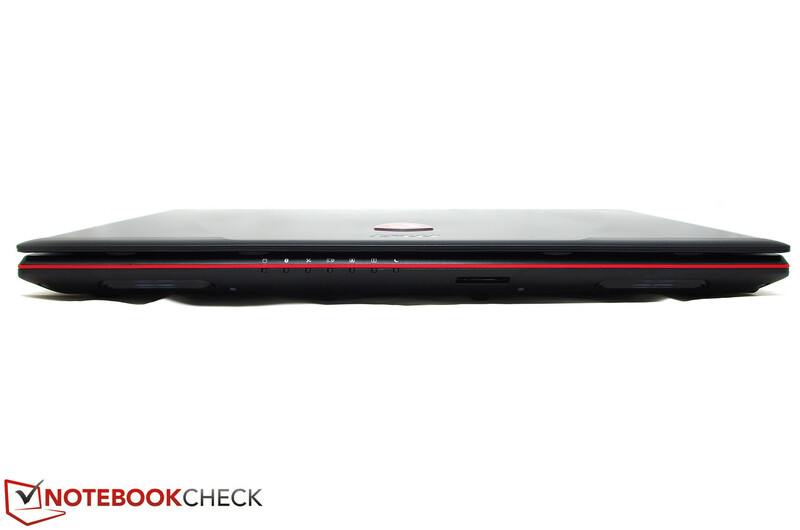 The A504 takes a clear lead thanks to its SSD. 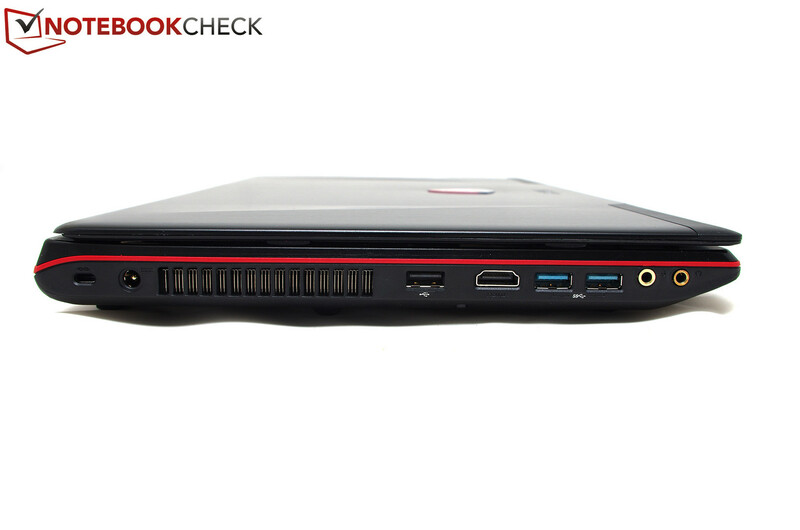 In PCMark 8, the GE60 scores 3,242 points in the home benchmark. 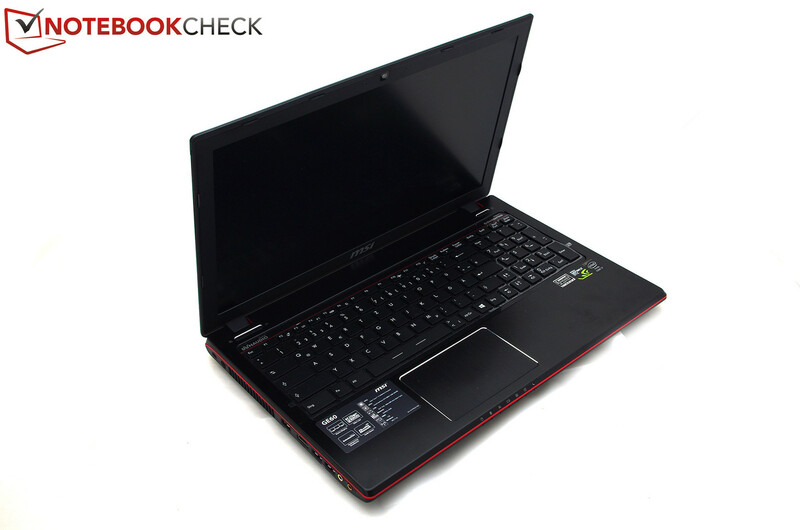 The Asus G750JZ reaches a similar score due to its identical processor and a GTX 880M from Nvidia. 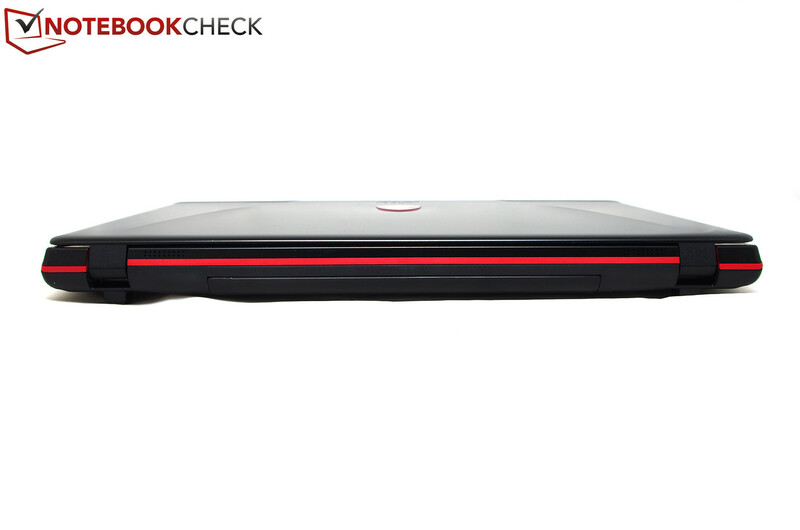 The Western Digital hard disk inside the notebook offers average performance. 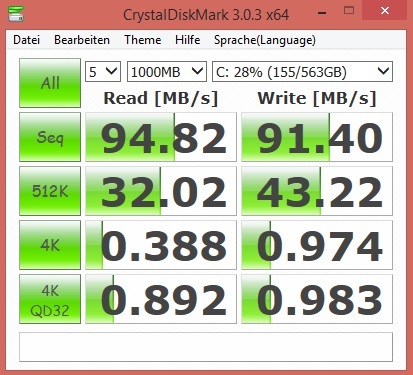 The CrystalDiskMark benchmark certifies the HDD with good read and write rates. 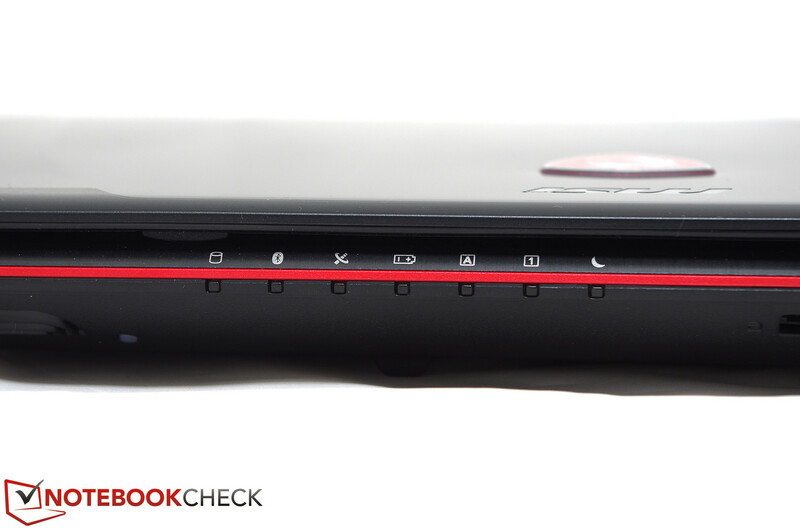 In other notebooks, like the Acer Aspire E1-772G, this HDD could deliver fast data transfer rates of up to 108 MB/s. The test model achieves around 94 MB/s. Faster system performance is possible with an SSD. 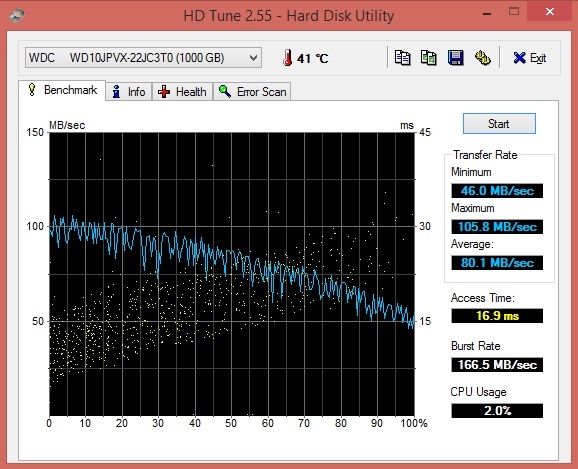 The bloatware in our test model is responsible for the decrease in performance of the HDD. The Intel HD Graphics 4600 saves a lot of power, especially when the notebook is performing less-demanding graphics tasks. 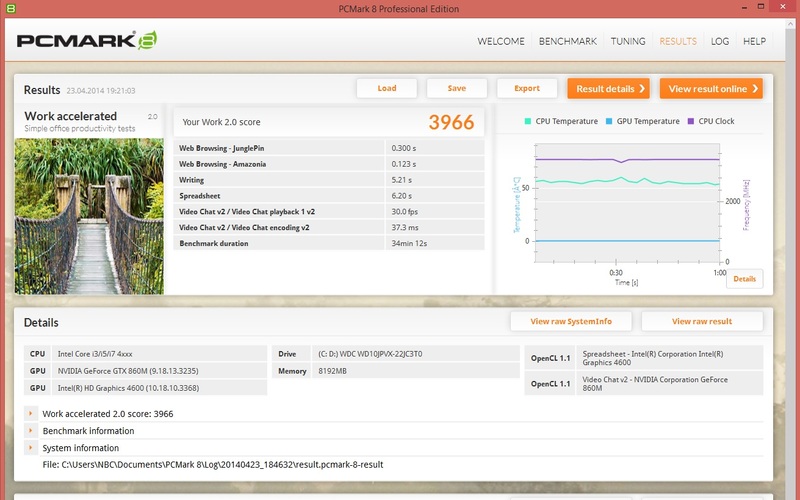 Demanding games and 3D applications will turn on the GeForce GTX 860M which offers more graphics performance. The GeForce GTX 860M was introduced in March 2014 and is based on the new Maxwell architecture. 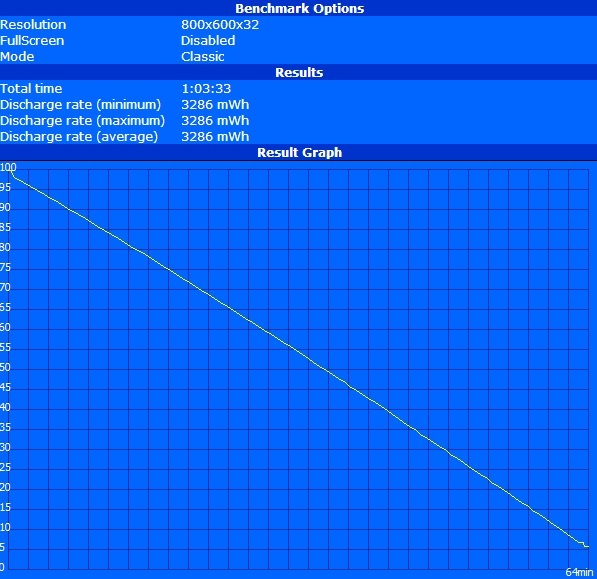 The graphics card utilizes a GM107 chip, which has been radically optimized. The 640 shaders and a clock speed of 1,029 MHz with Nvidia Boost places the GTX 860M in the high-end class amongst mobile graphic cards. In 3D Mark 2013, the GeForce GTX 860M scores 14,746 points and performs at the same level as the older GeForce GTX 770M, which we know from the DevilTech Fragbook DTX. In the Fire Strike benchmark, the graphics card scores 3,679 points and surpasses even the GeForce GTX 770M by a clear margin of 10-15%. Theoretical benchmarks do not give us an accurate impression of the actual gaming performance. That is why we tested the GE60 with the latest games. Metro Last Light ran at 50 frames per second with the High settings, which provides the gamer a fluid experience. 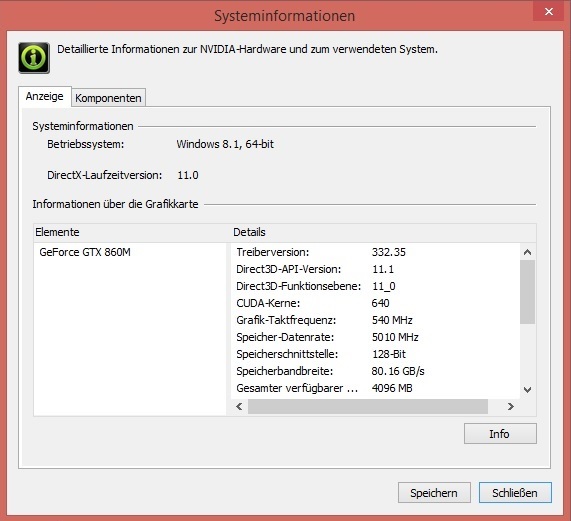 This place it at the same level as the Aorus X7, which uses a GeForce GTX 765M SLI system. Full HD and maximum settings drop the frame rate to around 28 fps. 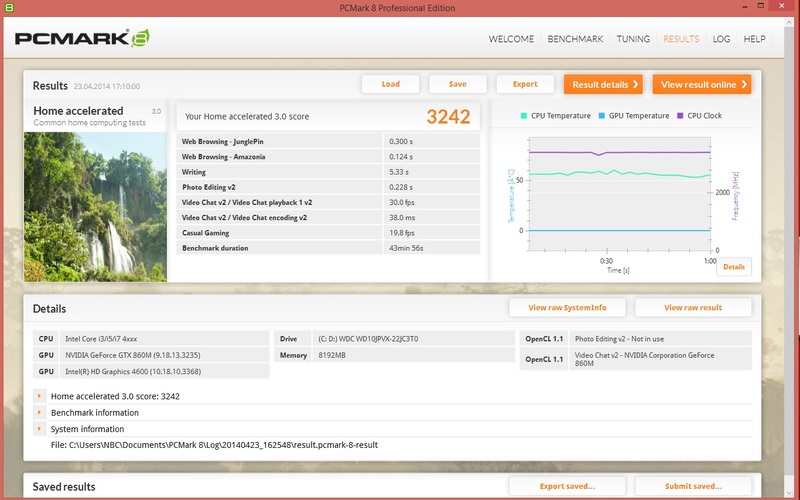 The Aorus X7 could offer 33 frames per second and was superior to the GE60. In ROME II Total War, the test model performs at high settings with ease. 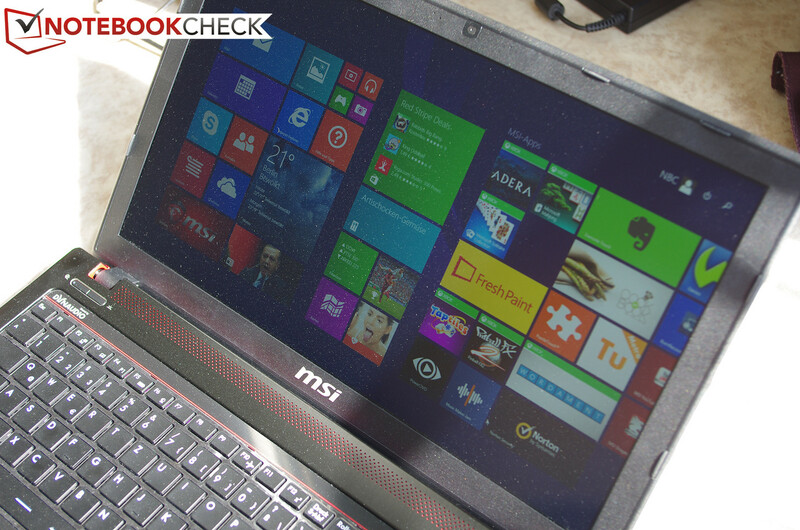 The laptop manages an average of 114 frames and provides a fluid experience. 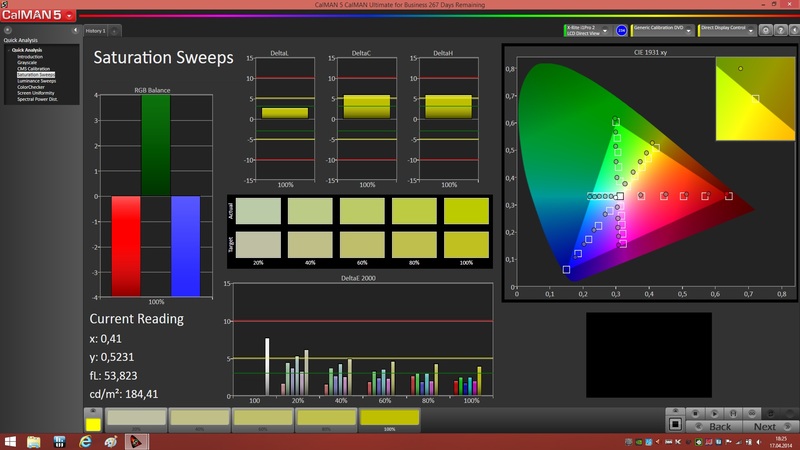 However, raising the settings higher (to Extreme) dropped the frame rate down radically: 22 frames. This is understandable as we could only use this setting comfortably with notebooks which had a GeForce GTX 780M or a GTX 880M. We were a little disappointed by the fan. The GE60H can also get quite loud at load (45 dB(A)), but our test model manages to reach 48 dB(A). At full load, the GE60 reaches 50 dB(A). The GE70 is far superior as it is quieter despite powerful hardware. Despite the loud fan, the GE60 quickly reaches critical temperatures. While idle, the surface is still comfortably cool, which is thanks to the metallic surface of the chassis. During the stress test, the temperatures rise rapidly and the top and bottom reach critical values (around 50 °C; 122 °F). 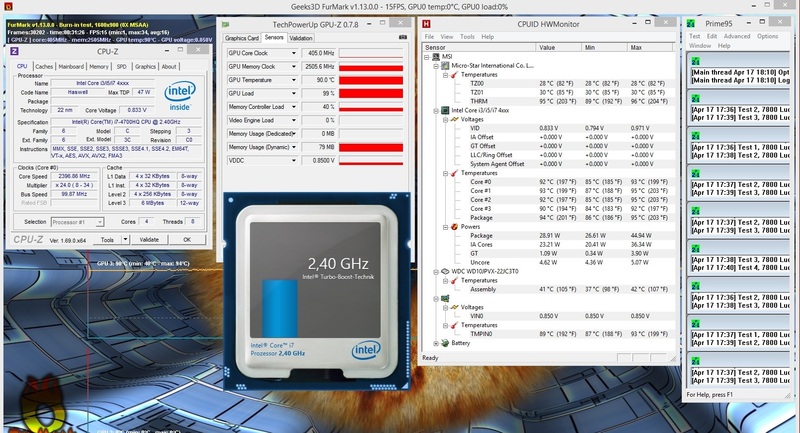 Thankfully, the GPU and CPU are a little better and hit a maximum of 90 °C (194 °F; GPU) and 92 °C (197.6 °F; CPU). 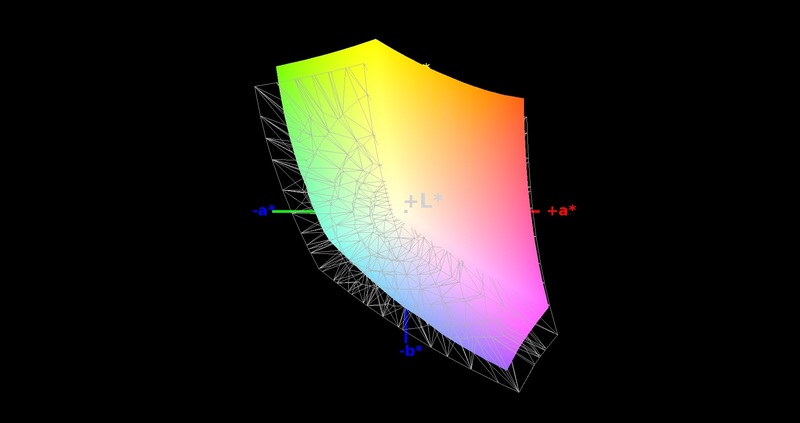 These values are 5 °C (9 °F) lower than those of the GE60H. (-) The palmrests and touchpad can get very hot to the touch with a maximum of 42.9 °C / 109.2 F.
(-) The average temperature of the palmrest area of similar devices was 28.7 °C / 83.7 F (-14.2 °C / -25.5 F). Like in other MSI notebooks, the manufacturer has installed four speakers in our GE60 test model. Thanks to Sound Blaster Cinema technology, and the good quality of the speakers, the sound output is quite impressive and can convey highs and middle notes clearly. 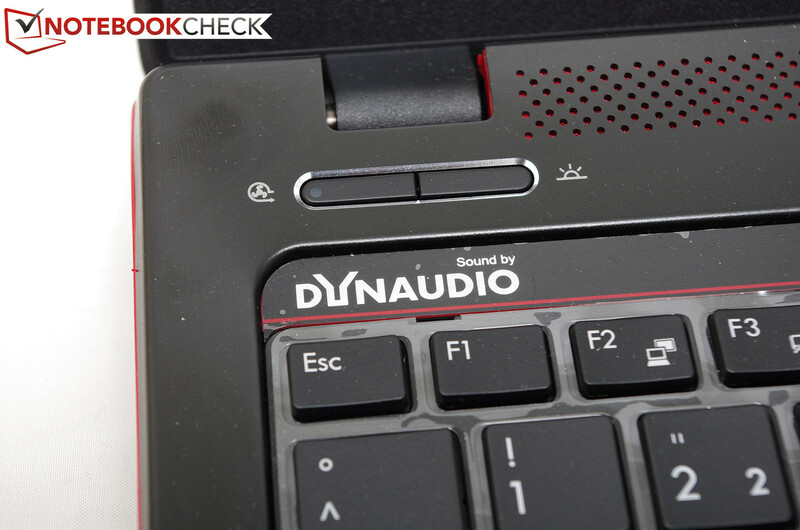 The bass is weaker due to the build of the laptop. Although our test model has more performance than the GE60H, its power consumption leaves no room for complaint. 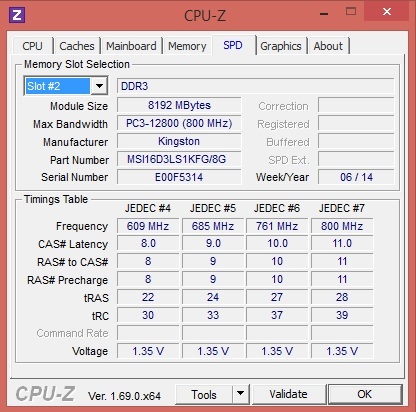 While idle, the test model reaches a maximum of 23 W, which is an improvement, when compared to the 27 W of the GE60H. 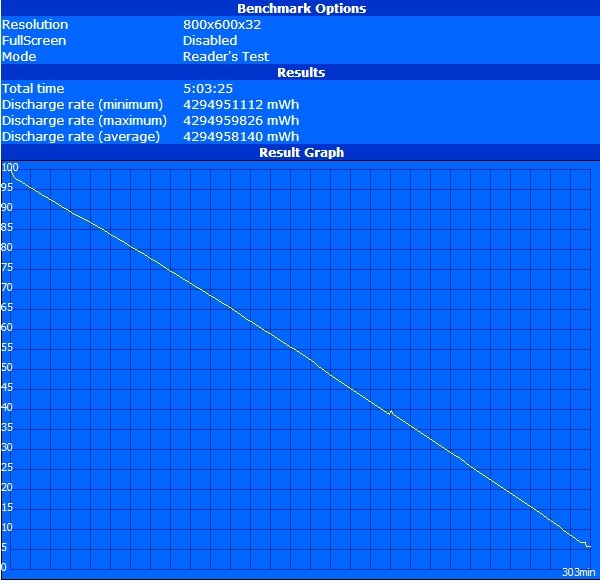 The power consumption at load (122 W) is acceptable. The predecessor requires a little more: 126 W (despite lower performance). The battery (49 Wh and 4,400 mAh) is a little weak, especially for a gaming laptop. As such, the GE60 cannot run for impressively long periods of time. When idle, the laptop runs for 5 hours and 3 minutes. Surfing with WLAN is possible for 3 hours and 42 minutes, which is 40 minutes longer than the GE60H. The test model manages to last long enough to play an entire DVD: 2 hours and 29 minutes. If you want to game while on battery, then the GE60 will be running on fumes within 1 hour. Good performance and low weight. 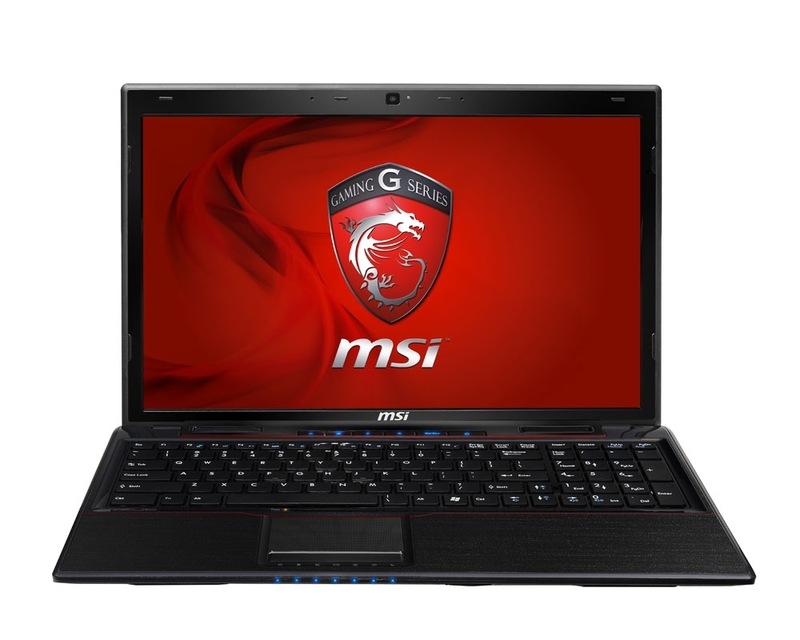 A faster processor and an advanced GPU are great features of the MSI GE60. In comparison to the predecessor, the GE60H, a few areas have improved. Despite higher performance, the power consumption is lower and the battery life has increased. The gaming performance is impressive for considering the price of 1,200 Euros (~$1636). Even the display can impress us. However, we wish for a larger battery (not the most important feature for a gaming laptop), a sturdier case as well as surfaces, which attract less smudges. 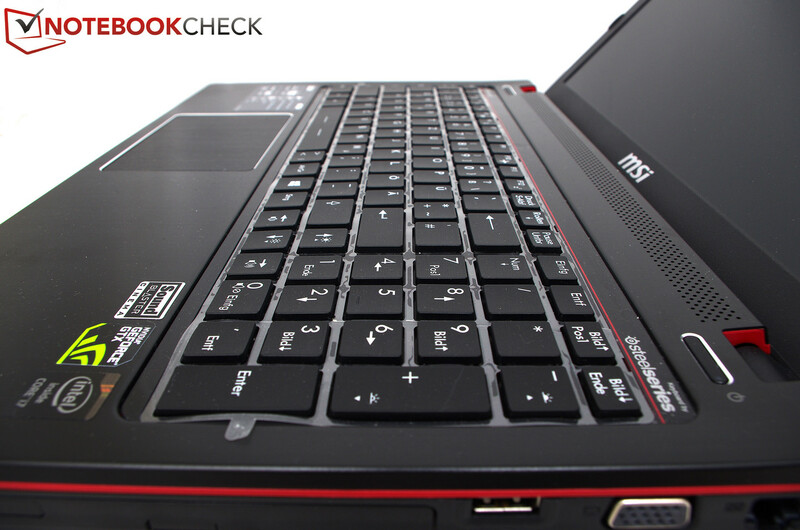 Overall, we find the MSI GE60 to be a reliable notebook equipped with a high-quality keyboard and good gaming prowess. The top attracts fingerprints and smudges. The flat build helps with the weight. 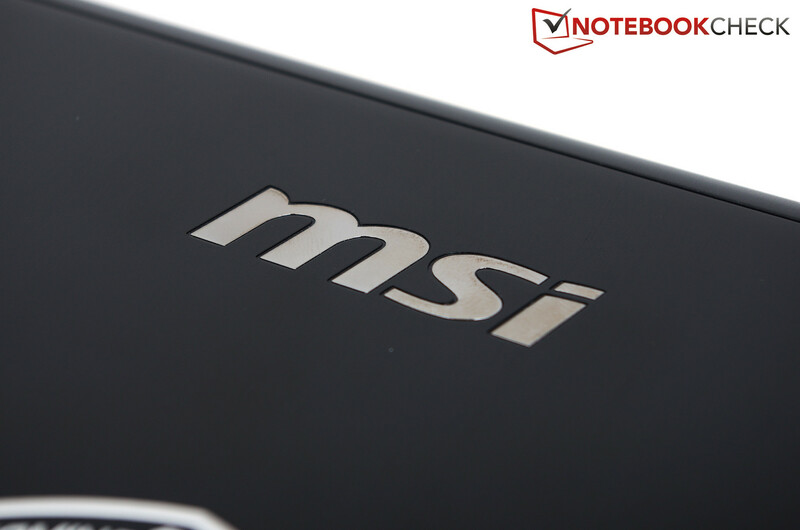 The MSI tag is placed over the logo. Good connectivity on the left side. ... looks good and stay cool. All you need - inside. The power outlet is placed on the rear (left side). The test model is equipped with a Blu-ray drive. 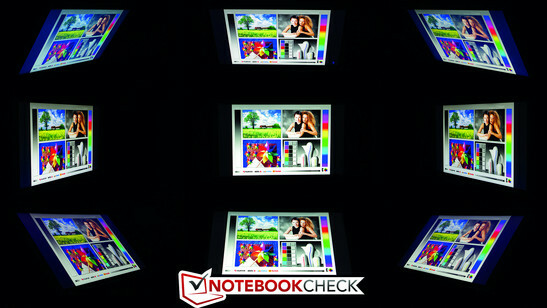 LEDs show the status of the hardware within the notebook. There is even enough space for a Numpad. Strong reflection from the sun. From the sides, the picture is still recognizable. ... and have a short stroke distance. The mouse keys have been placed inside the touchpad. A VGA interface is also on-board. The front is adorned with a red stripe. The performance paired with the low weight. An SSD would boost the system performance significantly. There is too much bloatware on the hard disk. The display has strong contrast and is good for gaming.